Attention deficit hyperactivity disorder is one of the most common psychiatric conditions in childhood. One of every 10 Americans aged 4 to 17 – more than 6 million kids and adolescents – has been diagnosed with ADHD. The single most frequent treatment they get is prescription drugs for children with ADHD, specifically stimulants like Adderall and Ritalin. The modern pharmaceutical therapy for ADHD traces back to 1937. That’s when a Rhode Island physician named Charles Bradley discovered that Benzedrine, the first drug to contain the potent stimulant amphetamine, had the “paradoxical” effect of subduing some children. Medication is an effective and recommended treatment for ADHD’s three hallmark traits: hyperactivity, impulsivity, and inattention. 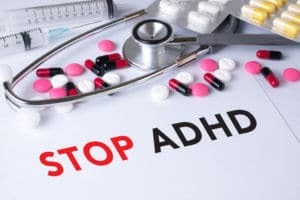 However, the FDA classifies both types of stimulants prescribed for ADHD as Schedule 2 drugs, meaning that they have a high potential for abuse or severe dependence. In fact, stimulants are second only to marijuana as the illicit drug of choice among college students. For children under 6, the American Academy of Pediatrics recommends behavior therapy first. If symptoms don’t improve enough, doctors can prescribe methylphenidate-based stimulants such as Ritalin and Concerta. Research suggests that even for older youths, behavioral therapy can be an effective alternative to medication. According to Anil Chacko, professor for Counseling@NYU which offers an online masters in school counseling from NYU Steinhardt, counselors and teachers can use evidence-based interventions to help students with ADHD manage time and stay organized. Strategies can include seating an easily-distracted student near the teacher or giving him a chance to move around by handing out assignments. These kinds of techniques can work equally well for students from elementary to high schools. Children who get behavior therapy first may improve faster than their medication-first peers. Yet, the fact is that the majority of children and adults with ADHD rely on medication to keep their symptoms in check. Stimulants are thought to work by boosting the level of a brain chemical called dopamine, a key neurotransmitter for attention and focus. ADHD medications work well for about 80 percent of people who take them. Over the decades, doctors have prescribed various drugs to quell hyperactivity and to focus the ADHD brain. Among them were the schizophrenia drug Thorazine (chlorpromazine) and Cylert (pemoline), a stimulant pulled off the market in 2005. However, the basic active ingredients in most prescription drugs for children with ADHD have changed little since Dr. Bradley’s time. As Schedule 2 drugs, these stimulants by definition are the most dangerous of all legally controlled substances. That’s because the federal government, though not all states, deems Schedule 1 drugs like heroin and marijuana to lack any medical use; they are therefore labeled as illegal. Amphetamine, a generic stimulant included in Adderall, is also known as speed or uppers. Among the street names for methylphenidate, the active compound in Ritalin and Concerta, are Skippy and the smart pill. Stimulant abuse and addiction are rising problems in schools and colleges. Some students with legitimate prescriptions take them to get high. Others “pop pills” to cram for exams and to stay awake. In recent years, a surging number of young people have been obtaining the stimulants illegally, most often through someone who has a legitimate prescription. Long-term use of stimulants can lead to dependence and addiction. A person might need to take more and more in order to chase the feeling of euphoria. Quitting the drugs could trigger withdrawal symptoms, including insomnia and depression. All of these factors create a growing challenge for school counselors to help steer students away from harm – while balancing the proven benefits of prescription drugs for children with ADHD on the brain disorder. Alexis Anderson is a digital PR coordinator covering K–12 education at 2U, Inc. She supports outreach for their school counseling, teaching, mental health, and occupational therapy programs. Alexis is interested in topics related to education, advocacy, and wellness. Say hi on Twitter @HeyLexHey! Finding a Recovery Center – How Hard Is It?